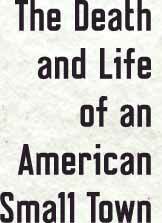 Now available in paperback after seven hardcover printings, the New York Times bestseller Methland: The Death and Life of an American Small Town, has been widely-lauded, reviewed, and referenced. Featured on the cover of the Times Book Review and listed among the year’s 100 Notable Books, Methland won the 2009 Chicago Tribune Heartland Prize as well as the 2010 Hillman Prize for Book Journalism. The book was picked as a best book of the year by the Los Angeles Times, the San Francisco Chronicle, the Saint Louis Post-Dispatch, the Chicago Tribune, and the Seattle Times. In January 2010, the British Broadcasting Corporation purchased global movie rights to the book. Methland tells the heroic story of the small town of Oelwein, Iowa–and, through it, the story of drug abuse in Rural America. Once a railroad, meat-packing, and farming hub, Oelwein has been battered by the Farm Crisis and decimated by job losses. More recently, thanks to the lobbying of pharmaceutical companies in Washington, D.C., record amounts of methamphetamine, aka crank or crystal meth, are available on Oelwein’s streets. Like thousands of other small towns across the United States, the drug’s production has become one of Oelwein’s principal business. Now, the town doctor, the mayor, and the prosecutor are fighting back. Journalist and native Midwesterner Nick Reding spent four years living off and on in Oelwein. Along with the book’s three principal characters, Methland follows the traffickers, addicts, federal agents, and politicians whose lives make up a uniquely contemporary American tragedy, blending sociology, history, and thousands of hours of eyewitness reporting into a real-life account that reads like a novel. Methland is ultimately a tale of enormous inspiration, as three men fight global forces in order to save their small hometown–a portrait not just of meth in America, but of life in America.